Sometimes we just have to bite the bullet, swallow it, and admit the obvious: we're cockups. 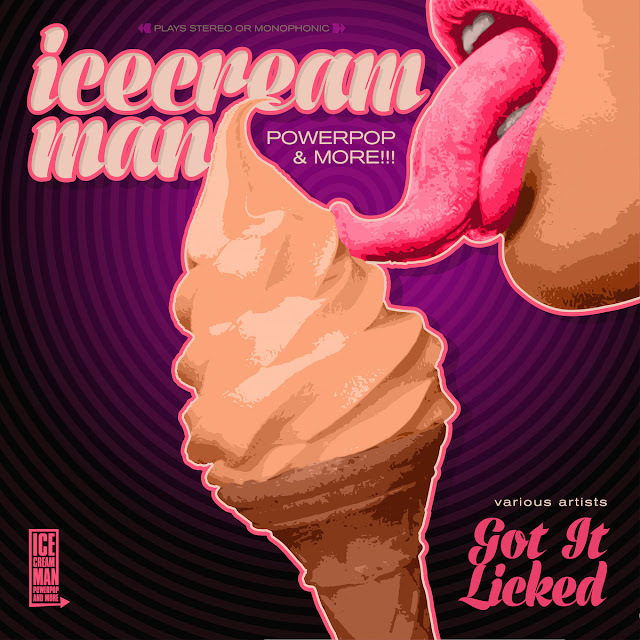 As soon as we found the colossal name-your-price compilation by the fabulous, absolutely essential Ice Cream Man Power Pop and More back on July 31, we were on it, sampling all 109 songs, notifying friends hither and yon, downloading the incredible thing, and popping our ears off. Unfortunately we didn't follow through with a post. Fortunately most of the other popperblogs did, so we're pretty sure you've already got it. Nevertheless, we're posting it, along with our sincere apologies and promises, sure to be broken, not to screw up again. Of course part of the problem was how to account for such a rich embarrassment of tuneage. No small problem indeed, so we're just going to post our seven very most favoritest songs and note the rest. It's so great feeling inadequate. And here are the other songs we especially loved (some of which we've previously posted and decided not to again, due to the previously noted embarrassments of riches and cockuposity. ): 4, 6, 7, 10, 11, 15, 18, 23, 26, 35, 40, 42, 43, 44, 50, 53, 56, 57, 64, 65, 71, 74, 79, 81, 83, 85, 86, 87, 89, 90, 91, 92, 93, 95, 96, 97, 101, 102, 103, 104, 106, & 108. Shadow Folk - "Dexter" & "Billy"